Measure AA, on the June ballot in all nine Bay Area counties, is a $12 parcel tax dedicated to protecting and restoring San Francisco Bay. It will create a stable revenue source for reducing trash and pollution, enhancing wetlands and wildlife habitat, increasing public access and recreational areas, and protecting communities from flooding. The tax will raise $25 million annually for 20 years and is expected to leverage significant additional state and federal resources for wetland enhancement and water quality improvement. SPUR strongly endorses Measure AA. This is a historic opportunity for the Bay Area to vote as a region and raise local revenue to protect our signature natural resource. But seizing the opportunity may be difficult: In order to pass, the tax needs approval from 2/3 of all nine counties’ voters. This is a high hurdle, but polling suggests it can win if there’s strong voter turnout in June. It’s our generation’s chance to save the Bay — while there’s still time. San Francisco Bay is a national treasure: It’s the largest estuary on the West Coast, home to 500 species of wildlife including millions of migratory birds, and an economic engine directly generating millions of dollars and jobs in the tourism, shipping and fishing industries. Originally home to more than 200,000 acres of tidal wetlands, they Bay only has about 45,000 acres of healthy wetlands today (a number that actually reflects significant progress in wetland protection and restoration). 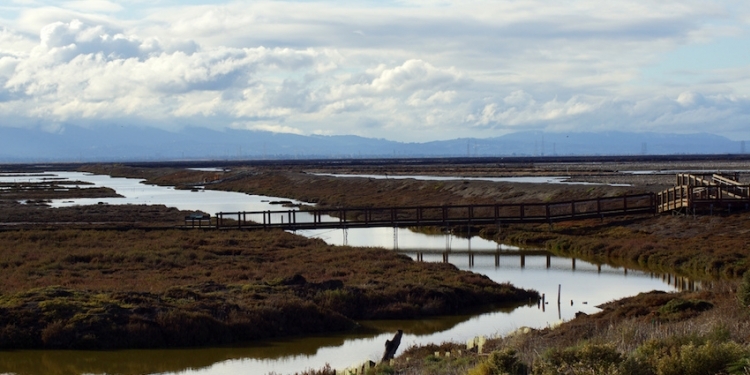 The Baylands Ecosystem Habitat Goals project, a multiagency effort to identify what kinds and amounts of wetland habitats around the Bay are necessary to sustain its health, set a goal in 1999 of restoring 100,000 acres. Since then, 15,000 acres have been restored and 35,000 acres acquired for the purpose of restoration. Although federal and state funding has made these acquisitions possible, restoration work — which consists of planning and permitting; breaching, repairing and building levees; assessing and monitoring tidal flows and habitat needs; transporting material; creating walking and biking paths and more — has been underfunded. Thousands of acres of publicly owned former tidal areas could be restored today if funding were available. According to Save the Bay, the backlog of restoration work on existing acquired lands is decades long. Because of climate change, the work needs to be done soon, which means the measure is urgent. A recent climate change update to the 1999 Baylands Goals report found that to protect the health of the Bay as it faces sea level rise, 50,000 acres of wetlands must be restored in the next 15 years. The local revenue raised by this ballot measure is expected to leverage additional state and federal resources, and hopefully attract additional private resources to speed up the progress of restoring the Bay before our tidal wetlands drown. The measure requires revenues to be spent in all nine counties over the 20-year life of the tax and includes a requirement that 50 percent of revenues be spent on a population-weighted basis in the four subregions of the Bay (North, South, East and West). The measure requires public meetings of the Bay Restoration Authority, requires an annual audit and report, establishes an advisory committee and an independent citizen oversight committee, and limits the amount of revenues that can be spent on program administration to 5 percent. SPUR has been a longtime supporter of protecting and restoring the Bay, beginning with our involvement in establishing the Bay Conservation and Development Commission in 1964–65. We have been regional leaders in raising awareness about sea level rise and climate change adaptation since 2009. In 2013, we endorsed the idea of the Bay Restoration Authority’s quest for regional funding, but the authority did not decide to move forward with a revenue measure until this year. A parcel tax is generally considered a regressive form of taxation. However, levied at only $12 a year per parcel with possible exemptions to be considered by the authority, the amount is too low to raise concerns about fairness. In some ways, the measure could be seen to be missing an opportunity to raise even more funds for Bay restoration by structuring the tax differently, such that higher valued parcels or richer owners would pay more. But polling has consistently shown that a tiny parcel tax is likely to be most successful at the ballot. Additionally, the measure is not designed to provide any particular class of waterfront property owners significant benefits or flood-risk reduction. It is meant to benefit everyone by enhancing our region’s signature natural resource. Measure AA gives us all the chance to participate in saving the Bay again, following in the footsteps of those who demanded its protection from further filling and speculation in the 1960s. This time the opposition — sea level rise — is less within our control, but we’ve been warned, and we know what to do. Please join SPUR this June in voting “yes” on Measure AA to save the Bay’s tidal marshes, improve public enjoyment of the shoreline, protect habitat and wildlife, and maybe even spare ourselves from some of our warming world’s future floods.